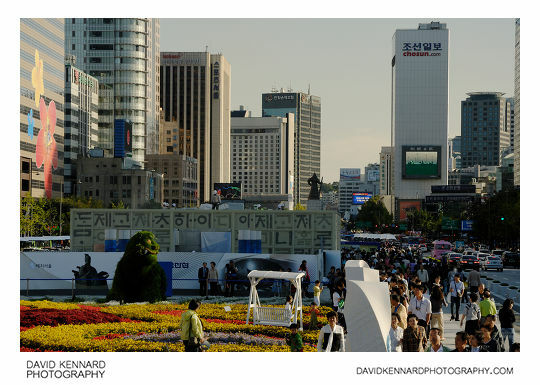 Alongside the flower carpet section of Gwanghwamun plaza, they had small raised platforms that you could go up, giving you a slightly better view of the flower carpet. 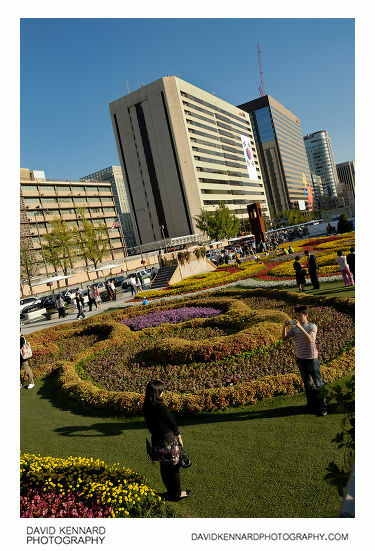 The flower carpet is planted in the traditional Korean Dancheong (단청) pattern. 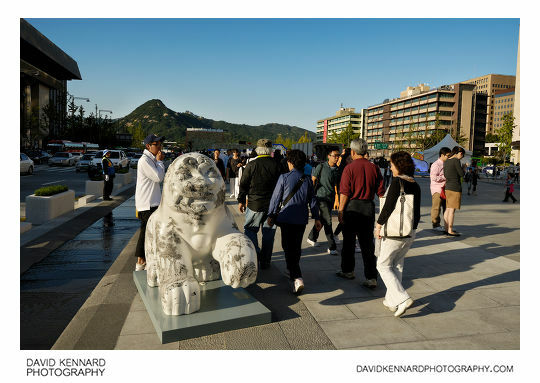 Along the sides of Gwanghwamun Plaza there were some decorated fibreglass Haechi / Haetae, a bit like the fibreglass cows. The Haechi (해치), or Haetae (해태), is a fire eating dog that has become the mascot for Seoul. 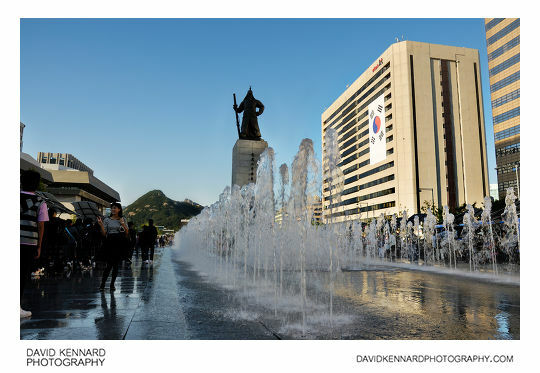 Admiral Yi Sun-sin was Korea's most famous Naval commander. He fought against the invading Japanese in the late 16th Century, winning every battle he fought in, and inflicting heavy losses on the Japanese navy. 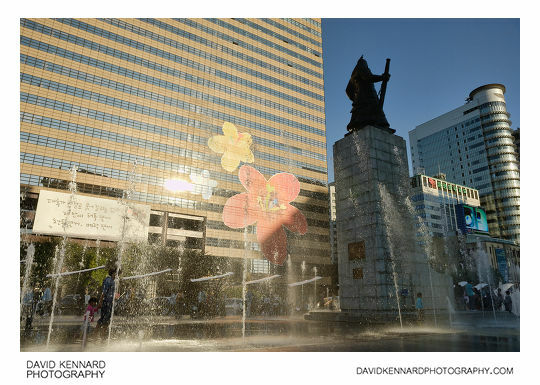 The fountain is called the 'Admiral Yi Sun-sin Fountain' (이순신 분수), or is also known by the name “Fountain 12.23“ (분수 12·23). This is because 12 is the number of ships Yi Sun-sin used to defeat an opposing Japanese force of 133 vessels, and 23 is the number of battles Yi fought and won. 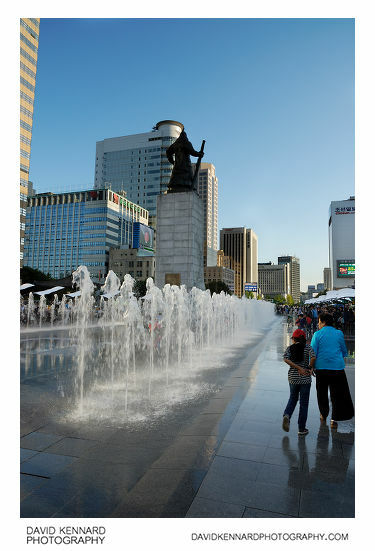 There was some controversy over the name 'Fountain 12.23' though, as 23rd December is the birth date of Akihito (明仁), the current Emperor of Japan. (Korea and Japan have long had an uneasy relationship).